Kentucky Proud Rhubarb Pie..fresh rhubarb, strawberry extract and strawberry jam are the secret ingredients in this "spring tonic" offering. Second place at Red State Barbecue Fruit Pie contest June 26, 2013. Kentucky Proud Rhubarb Pie..fresh rhubarb, strawberry extract and strawberry jam are the secret ingredients in this “spring tonic” offering. 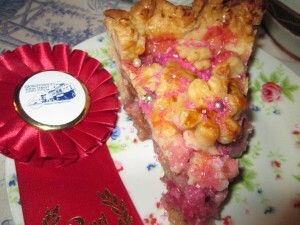 Second place at Red State Barbecue Fruit Pie contest June 26, 2013.